Japanese Episode AG 142: "Nyula and Barriered! Whose Restaurant!?" American Episode 412: "Hail to the Chef!" The Rocket-Dan have lost their way in the woods, so they become happy when they find a restaurant in the middle of nowhere. The restaurant's proprietor, Res, invites the trio into her shop, offering them anything they want for free. As Musashi and Kojirou enjoy the food cooked by Nyula, the restaurant's chef, Satoshi and his friends come across a similar restaurant next door. This store, run by Taurant, has a Barriered hired as the chef. Before long, it is revealed that Res and Taurant are sisters who are arguing over who will take over their father's restaurant! Res ' pokemon can cook well but has issues with presentation, while Taurant's pokemon can put on a great show but can't cook to save its life. After quarreling for some time, the two siblings decide to have a cook-off to determine who will become the head of the restaurant once and for all. After a long night of training, Barriered and Nyula face off in a cooking competition that shows just how much their skills have grown. Before the pokemon can serve the food they've prepared, the Rocket-Dan appear and attempt to kidnap Barriered, Nyula, and Pikachu. Res steps up and has her Barriered unlock its cage with Confusion, allowing all the purloined pokemon to escape. After Nyula punctures the Rocket-Dan's balloon, Res decides to give the restaurant over to her sister, but Taurant decides on a co-ownership instead. Now that the two sisters have come together, our heroes continue on the road to Yamabuki City. Well, after weeks and weeks of bland filler, we finally get a good one. It's been a while since we've had a really bizarrely animated comedy episode, so an episode like this in the middle of a bunch of lackluster episodes is a welcome breath of fresh air. According to PokeAni, this episode is a parody of Mister Ajikko and the Dotchi no Ryouri Show, but it also aired in Japan after Yakitate! Japan became popular, so it's hard to say which show(s) this episode is pulling inspiration from. As much as I love this episode, its Japanese title is misleading as hell. I mean, when you have Barriered and Nyula as the main episode, wouldn't you expect to see Manene and Manyula (pokemon in the same evolutionary line) show up as well? This episode aired in Japan around the time the Lucario movie was playing in theatres, so it doesn't make any sense why they wouldn't feature these pokemon. As we'll find out later, the anime producers love to give us misleading episode titles in the Battle Frontier, so don't be surprised if your high expectations are destroyed time after time. There were a few other things that bugged me. Why was Masato so surprised to see two restaurants in the middle of nowhere when they were just waiting in line at a cake shop, also in the middle of nowhere, in the Windie episode? And why have the writers suddenly decided to have humans react to seeing a talking Nyasu? This is only the second time in Advanced Generation that they've acknowledged that it's not normal for a Nyasu to speak human language (the first time being "A Hole Lotta Trouble"), so it's pretty weird they'd bring it up now after so long. Finally, during the training scenes, I have to wonder what purpose Takeshi had in mind when he was making Barriered make pizza after pizza. How in the world does making something as simple as a pizza help the pokemon make some kind of curry-type dish? The dubbed version is weird because it features a bunch of new music we hadn't heard before. If 4Kids is going to start making all-new music for the series, why are they starting to do it now when they only have a few episodes left? I'm only bringing this up because I know I'll get e-mails about it if I don't, but it concerns the milk in a wine glass scene. Basically, it wasn't edited in any way; what you see in the dub is the same you see in the Japanese version. 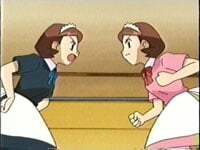 During the pokemon's cook-off, Pokemon HaraHara Relay is played in the background of the Japanese version. In the dub, we get all-new instrumental music. The attack Barriered uses to open its cage is Confusion, but the dub tells us it's Psychic attack. Oops. Three seconds are removed from the shot after Kids' WB! 's final commercial break. Two seconds are shaved from the TO BE CONTINUED... screen.